Click on image to open form. As a one-time courtesy, our billing office will provide you with an insurance information sheet within your ﬁrst two visits. We believe your regular attendance and participation is important in returning you to your previous level of function and/or your return to work. Should you need to change your appointment, Deer Park Physical Therapy asks you to reschedule by 5 p.m. the day prior to your treatment. Please give us a call if you are unable to attend; your call will enable us to manage our scheduling, more efficiently. If an emergency does occur and you need to cancel your appointment after hours, please leave a message on our answering system. Please fill this form out, and bring it with you on your first visit to speed up the check in process. 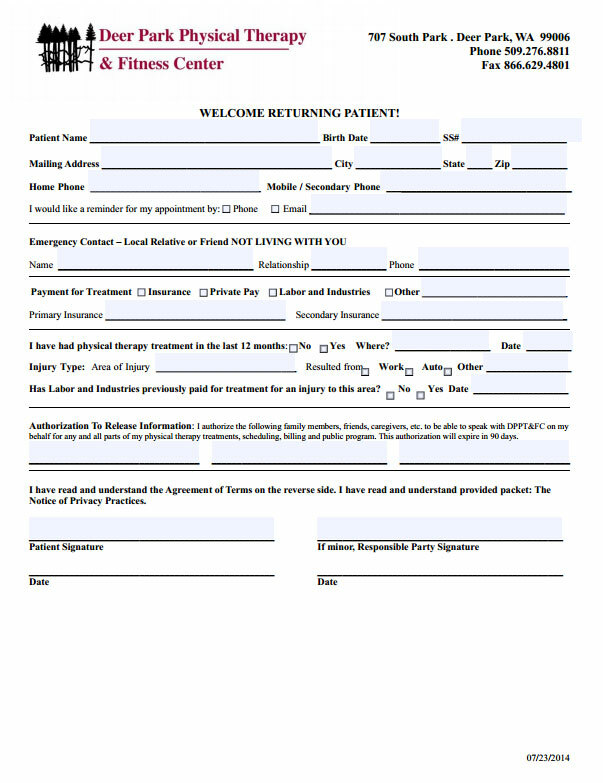 Please fill this form out, and bring it with you on a return visit to speed up the check in process.